Dogmantics Dog Training Blog: Does your dog have a waist? Does your dog have a waist? 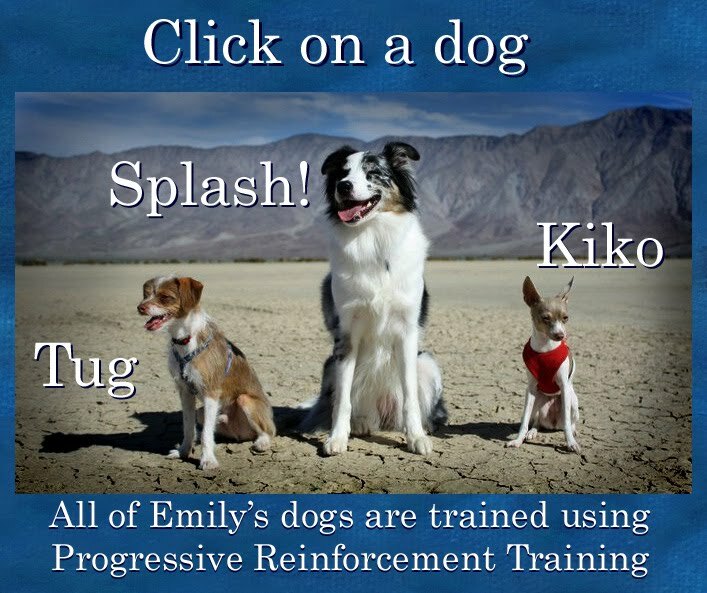 If you are interested in working on tricks and behaviors with your dog, your dog should be the proper weight to prevent injury, discomfort and disinterest in working. A dog that is even slightly overweight can loose interest in working for food (not all dogs mind you!). 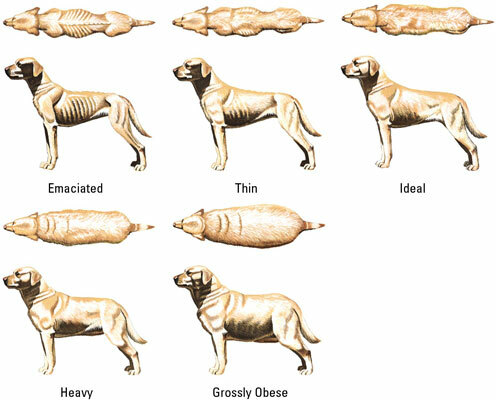 If your dog is slightly overweight, try to maintain your dogs appropriate weight and see what a difference it can make in training. All dogs should have a waist!!! Depriving a dog of food is not the idea, the dog should feel comfortable not hungry. If your dog is ravenous, feed a small meal before training, to stop frustration. I got this weight chart off the internet, I could not find who is the actual artist who created it, as it was on many internet sites without credit. So if you know where this diagram originated, please let me know so I can give them credit for their work! A lot of vets will not tell you that your dog is overweight! It is up to you to assess your dogs weight and decrease or increase calorie intake accordingly. 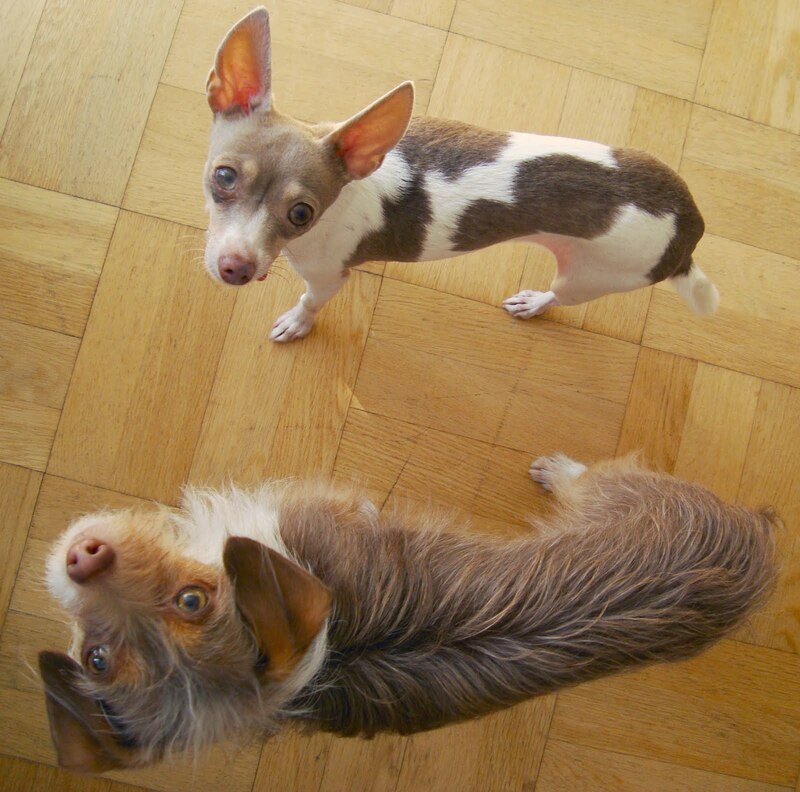 It is especially important with toy dogs as they can gain and loose weight rapidly if you feed a varied diet. 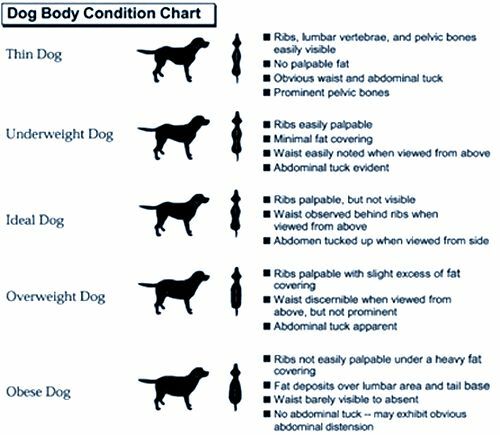 The chart that you posted is a universal chart that most veterinarians use to score the body condition of dogs (and cats). Its called the "body condition score chart". Its on a scale of 1 to 9 with 4 to 5 being ideal. I don't know if anyone knows who the original artist is...I would imagine it was created by one of the vet schools or dog food companies. It's been around for a long time. Hope that helps! Thank you for sharing this and all your wonderful videos. Emily, I'm 90% sure the chart is from Purina Dog Foods originally. Thanks for highlighting this, because I personally would call about 75% of American dogs (and 95% of cats) overweight. Don't rely on your vet saying anything about your pet's weight. Vets often don't want to offend people and don't say anything to customers whose pets are OBESE, much less those whose pets are only somewhat overweight. Also, vets tend to see so many overweight pets, I think it starts to look "normal" to them. I keep my dogs slim for sports, and they've all lived 14.5-16 years old. I just wish my dogs could control my weight as well as I control theirs! In germany the vets w i l l tell you, but only to sell industriel "light food" for dogs. They are 2 kinds of vets here. 2) who only wants to earn money. For germans, read: "Hunde wuerden laenger leben, wenn..."
Thanks Emily - as always. this is a pet peeve of mine, I hate seeing fat dogs, I see more fat dogs in the area we live, than slim dogs! Hi. Love your vids. I have a puppy that looks pretty "ideal" by this scale, and yet she is always eating dirt. I read several places online that suggest this might be a nutritional or behavioral problem. If its the latter, do you have any suggestions or a video tutorial addressing the problem. She is so close to the ground, i don't want to always stop her from sniffing and doing what dogs do, but it makes me uncomfortable knowing that she might be ingesting something like rocks, or splinters of wood, or other stuff that is going to end up as puppy vomit on the carpet or much worse, an emergency trip to the vet. chrs- I don't have a video on eating dirt. There is a disorder called Pica, which some dogs have where they eat non nutritive substances... I would teach a default leave it. Splash tends to dig when in the forest, and as she is digging instead of spitting the dirt out sometimes she swallows it. Splash also has tendency to eat cardboard. So I will tell her drop it if she starts to want to eat the cardboard she is playing with. Detector Billetes falsos Wow this is a great post. I just lived reading it. It contains so much information. I really enjoyed reading your article and i absolutely loved it….Thank you for posting it and keep up the good work. May God bless you.